Mattel may be dragging its feet on giving us a 6″ Keaton Batman, but if you like your Batmans nice and big – 18″ big – NECA’s got you covered. Seriously, how beautiful is that figure? I don’t usually collect the 18″ size but damn, that’s tempting. A third Alternity x Super GT figure has been announced. Head Decepticon Megatron’s car form will include his color scheme and he will have a new Race Queen accomplice as well. This new figure is listed at $109.99. Bandai Japan is releasing S.H. Figuarts figures for War Machine and Iron Man Mark VI as they appeared in “Iron Man 2”. The Figuarts line is known for producing high-quality, well-articulated figures, and these will also come with alternate hands, rocket effects and more. We have Iron Man Mark VI listed at $69.99, with War Machine at $74.99. We also have mini figures from “Alien”. The assortment includes two different alien poses as well as a Chestburster with Egg, a Facehugger with Egg and a Marine in space suit. They are available as random singles at $5.99 each, or as a Bag of 30 at $149.99. Now you can make popsicle-lightsabers for your little and not-so-little Star Wars fans. This set comes with four lightsaber molds as well as a cookbook with 30 recipes for refrigerated Star Wars-themed treats, and is listed at $24.99. We will be getting a special shipment of MP-17 Masterpiece Prowl, MP-18 Masterpiece Smokescreen and MP-19 Masterpiece Bluestreak for customers who are interested in them. These packages are listed at $87.99 each. These large-scale swords are great additions to Fortress Maximus, Galaxy Convoy and other figures. They come in Red, Blue and Silver versions, and are priced at $54.99 each. They can be assembled in multiple ways, making them work for a variety of figures. It is time for another new list of exclusives. This list includes Kanetsugu Naoe Swimsuit Version 1/8 Scale Pink exclusive for $159.99 ($179.99 for version with bonus cloth poster), SDX Superior Dragon Gundam at $199.99, Super Robot Chogokin GaoGaiGar Mike & Piggy with Big Order Room Segment at $88.99, Kamen Rider S.H. Figuarts Hurricane Dragon Wizard, Land Dragon Wizard or Water Dragon Wizard at $78.99 each, Tiger & Bunny Figuarts Zero Nathan Seymour at $88.99, Kamen Rider S.H. Figuarts Medusa Phantom at $78.99, RAH Space Sheriff Scheider DX at $374.99 and Persona 4 High Priestess Satonaka Chie 1/8 Scale figure at $199.99. This exclusive version is designed from the one used by Captain Kruge in “Star Trek III: The Search for Spock”. It includes light and sound effects, and is priced at $59.99. Jun Planning is releasing extra stock of another Pullip / DC cross-figure. Batgirl has the signature Pullip look with a huge head and tiny body, and is listed at $145.99. Mezco is releasing a variant figure from their LDDP Universal Monsters subline. This version of their 10″ Frankenstein figure is done in a black & white color scheme just like in the original movie, and is listed at $32.99. The Thunderbird’s heavy equipment transport is the next to get a Revoltech entry. It will include a removable pod as well as the Thunderbird TB4 submarine. This ship is listed at $59.99. Underground Toys has announced three new Star Trek accessories. They include a Borg Cube Keyring Torch (flashlight) at $17.99, a Star Trek Science Emblem Wall Clock with Backlight at $29.99 and an Enterprise Projection Alarm Clock at $44.99. Museum Replicas has announced a number of new items. We have the Game of Thrones Coin Set at $58.99, Cernunnos Bust at $84.99, Historical Thor’s Hammer at $149.99, a Cimmerian Shield at $159.99, a Steampunk Skull at $29.99, a Webley Steampunk Pistol at $29.99 and Sea, Sky and Land Dragon Boxes at $45.99 each. Heroine from Fate/Zero Saber is next in line for a 1/6 scale Real Action Heroes figure from medicom. She will come with her sword and display base, and is listed at $238.99. The saber-wielding magical girl from Puella Magi Madoka Magica is also getting a new RAH figure. it comes with multiple sabers and is listed at $238.99. The third and final Space Sheriff series was Space Sheriff Scheider (Shaider), about an archeologist in Peru who becomes a protector in armor. His figure includes his sword and is listed at $374.99. ZC World has announced a new articulated body. This one is limited to 300 pieces, comes with a familiar head sculpt, alternate hands, a neck extension, a display stand and more, and is priced at $78.99. ZC World is also producing a 1/6 scale set of workshop tools to go with your figures. it is listed at $114.99 and includes overalls, boots, a helmet, dust mask, air compressor, circular saw, trolley cart, folding chair, tool box with removable tray, many tools and much more. This set shows the main characters around the outside with Oz towering about them, and contains quotes and more when opened up. This sculpture is listed at $249.99. This statue shows the title character from Oh My Goddess!”, with her angel companion Holy Bell floating above her. It is priced at $233.99, and is to arrive in August. Jakks Pacific is releasing items to go with the upcoming “Oz the Great and Powerful” film. These include Fashion dolls of Oscar Diggs, Glinda, Theadora and Evenora at $21.99 as well as China at $23.99. We also have the Bewitching Makeup Case at $14.99, a Spellbinding Necklace & Ring set at $7.99, Glinda’s Tiara and Light-Up Wand at $14.99 and a Reversible Witch Hat at $14.99. The main character and narrator of the classic holiday movie “A Christmas Story” is the latest subject of a Tonner Fashion doll. He stands 12″ tall and comes with a faux resin BB gun accessory. We have him listed at $149.99, $10 off of the MSRP. Toynami and DC are working together on a new line of 3″ Vinyl figures. The first assortment includes Superman, Batman, Flash, Joker, Harley Quinn and Mr. Freeze, and each figure is available singly at $9.99, or as a Set of 6 for $54.99, saving you about $5 off the MSRP. We have new Rag Doll Plushes. Creature Plushes, Back Buddies, Back Pack Pals, Messenger Bags, Large Plushes and even Giants Plushes for Chewbacca, Spider-Man Yoda and more. You can take a look at all of these new listings at the link. These mini figures show Rambo with a variety of weapons, like an assault rifle, a bow with arrow, a rocket launcher and more. We have them listed as a random single at $4.99, or as a Bag of 50 at $164.99. The first set of cassettes for Masterpiece Soundwave has arrived. Rumble (red color scheme to match the toys, etc.) and Ravage (aka Jaguar) include the weapons, and Rumble also includes his piledrivers, which can be used as a connector for Soundwave and more. This set will also fit inside the G1 Soundwave, and is priced at $59.99. The Takara releases of TG12 Air Raid, TG09 Starscream, TG08 Kickback, TG11 Ultra Magnus and TG10 Sideswipe from the Fall of Cybertron game have arrived. Each has a new deco separate from the Hasbro version (usually metallic) and is priced at $37.99. We also have the new Prime figures AM-33 Darkest Megatron with the Dark Saber Microns at $59.99 and the AM-34 Jet Vehicon General at $29.99. This new piece from eFX was created based on an original Lucasfilm Archives helmet. It comes with a Certificate of Authenticity and is priced at $158.99. Sideshow’s 12″ Militaries of Star Wars line has produced its next figure, the Snowtrooper. He comes with a survival backpack, cold weather assault gear, an E-11 Carbine Blaster, thermal detonator, display base and more, and is listed at $149.99. Diamond’s latest release includes the voice of Patrick Stewart as Captain Jean-Luc Picard and an all-new paintjob. We have this ship listed at $49.99, saving you $10 off of the MSRP. Our shipment had been delayed, but has finally arrived. This set includes Mr. Fantastic, the Invisible Woman, the Human Torch, Blastaar, the Puppet Master, Alicia Masters and two Moloids. This set is priced at $33.99, $6 off the MSRP. The first assortment of the new Battle Beasts Minimates is also here. This set includes Vorin the Ram, Scorpion, Merk the Falcon, Spider, Gruntos, Tate the Human, Snake and Bliss the Human. This assortment is also listed at $33.99, $6 off of the MSRP. Hot Toys has released a new 14″ City Hunter Predator from “Predator 2”. It comes with an exchangeable mandible, multiple palms, an extendable spear, an extendable disc, armor with an expandable metal blade, a medical kit, an oxygen mask and more. This figure is priced at $204.99, saving you $15 off of the MSRP. This display shows the team of “X-Men” that Norman Osborn put together when he was in charge of national security. It includes Namor, Wolverine’s son Daken, Emma Frost and the Mimic. The diorama stands 16″ tal by 13″ wide and 13″ deep and includes an alternate head with Cyclops’ glowing red eyes and alternate Iceman arm for the Mimic. This piece is listed at $339.99, $10 off of the MSRP. These popular figures came and went once, and we have just received our first restock of them. This Assortment includes three each of Heroic Age Iron Man and Iron Patriot and two of Classic Horned Iron Man, and is listed at $124.99. We also have them available as a Set of three for $49.99, and Iron Patriot is available singly at $18.99, with Heroic Age Iron Man available singly as well, priced at $17.99. A large shipment of Kotobukiya items has arrived, containing new and restock items. We have the GTF-11 Drio, GTF-11SR Drio SR, PTX-140 Hardballer Early Model and PTX-140R Hardballer R-Type from Lost Planet 2, along with Incredible Hulk, Nightcrawler, Daredevil, Sliver Surfer, Punisher War Zone, Cyclops and Thing Fine Art Busts, and Nova, Cable, Incredible Hulk and Abomination Fine Art Statues. You can see more details and pricing for all of these items at the link. We have received some Jitsu figures for our international and other customers – available now at $49.99. We also have a small quantity of Phantom Stranger figures in stock. 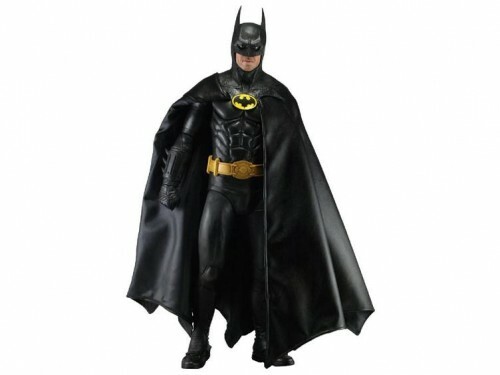 This character is an integral figure in the New 52, and his figure is listed at $29.99. The first three DC Domo POP Heroes figures have arrived. We have Batman Domo (Blue & Gray), Green Lantern Domo and Dark Knight Batman Domo in stock now, priced at $10.99 each.